Wondering where I might find N. today, taking the nap she swears she no longer needs. let her borrow that she fell asleep clutching it. right through some of the roughest wakes of the weekend. Nothing like a bed of potting soil pre-heated by the sun. Slept right through the planting of vegetables this year. I LOVE this post! 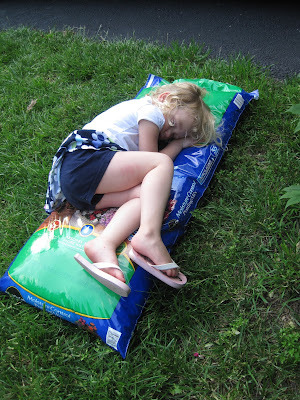 Summertime fun just wears them out...bet she's getting ready to have a growth spurt, too. My kids always did that! Joe showed me pics of the new bathrooms...gorgeous! I'm sad we didn't get to hang out during the renovation; as soon as this week is over, we'll make some plans to get together! I am constantly amazed by the uncomfortable spots children can sleep in. I get a sore neck when I sleep on a pillow that's SLIGHTLY too thick. I love that she fell asleep clutching the handle on the boat. So sweet. Nothing sweeter than the sight of a sleeping child. Little Bit is not as creative as N., but he regularly chooses to sleep on his floor instead of his toddler bed. The steamy potting soil pallet is my favorite!